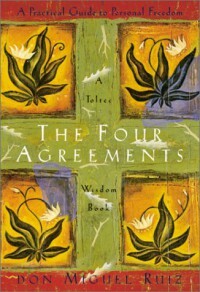 The Four Agreements (A Toltec wisdom book) by Don Miguel Ruiz is based on Toltec culture of Southern Mexico. The Toltec were group of scientist and artist who banded together to explore and hold onto spiritual knowledge. They believed there was a dream of earth, and one of heaven, and a fog that separates man from the more spiritual dream. This fog is created in part by the agreements a person makes with themselves, and those around them. These agreements represent the faith and values held by each person. The four agreements are ideals that eliminate the fog and bring a person closer to a spiritual life and happiness. The four agreements themselves are simple, universal, and incredibly powerful. The first, be impeccable with your word, acknowledges the power of words expressed to others, and especially powerful are the words of our inner dialogue. One’s expression that goes against themselves is considered “sin”. The second agreement, don’t take anything personally, keeps a person from internalizing negative messages from others, or losing humility when praise is given. This agreement keeps one focused on that which can be controlled, an individual’s own behavior. Don’t make assumptions is the third agreement and this agreement keeps a person from taking on the “poison” of false ideas. It keeps the focus on reality, and the moment at hand. The clear communication that results from this agreement has its own rewards. The final agreement, always do your best, is action of the other three agreements. It brings about a true understanding of one’s ability, and the self-esteem comes from living this agreement is yet another positive outcome.As powerful and simple guides of life The Four Agreements offer a pragmatic structure for living life. However, the agreements are mired in forced shamanism, and bad analogies that at times don’t make much sense. Apparently, we are all magicians capable of “good” or white magic; as well as “bad” or black magic. At one point Mr. Ruiz assures us that we can change ourselves from black magicians to white magicians. To have to dig through all the manure to find the seeds of these four powerful ideas is incredibly frustrating. The Four Agreements could be a much more effective work if it followed the very agreements it espoused.